Update: Both shows are now sold out! Two free evenings of magic and science! 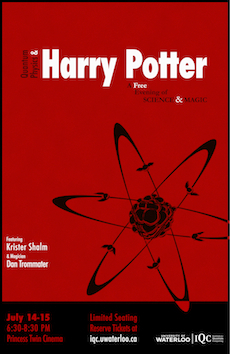 Magician Dan Trommater and I are teaming up once againfor a pair of fun, fascinating evenings exploring how the magic of Harry Potter mirrors the real magic of the quantum world. Levitation, teleportation and more—discover how these phenomena exist not only in Harry Potter's world, but in the quantum realm that underlies our world too. This is a non-profit educational event aimed at anyone who loves the magic of science. Dan and I held a similar event last year in Toronto that was a huge success. This year's show will be even better! SPACE IS LIMITED Reserve your free ticket here. For more information, visit or check out the Facebook event page. Sponsored by the Institute for Quantum Computing, University of Waterloo.